Our 64oz heavy-duty plastic River Growlers are durable, lightweight and affordable. With such a large capacity, the growler is at its best when filled to the brim with delicious beer from your favorite local brewery but is also great for water, iced coffee or juice. They're made of super strong PETG plastic that is recyclable, non-leaching and will not retain taste or odor. Our 64oz heavy-duty plastic River Growlers are durable, lightweight and affordable. With such a large capacity, the growler is at its best when filled to the brim with delicious beer from your favorite local brewery but is also great for water, iced coffee or juice. They&apos;re made of super strong PETG plastic that is recyclable, non-leaching and will not retain taste or odor. So fill one up and shove it in your cooler today! Just make sure to fill it up and be a hero at any: Backyard BBQ, Trip to the beach, Party or Picnic, Outdoor Concert, Car camping trip, or Tailgating with friends. 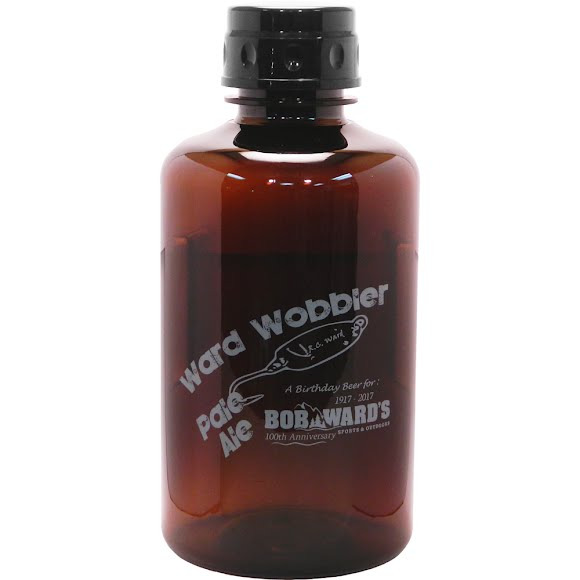 Limited Edition Ward Wobbler Pale Ale, A Birthday Beer for Bob Ward&apos;s 100th year anniversary celebration 1917-2017 graphic.